The victim is a 14 years old from Afghanistan. Killed by a car that did not stop. In the night between Thursday 15th and Friday 16th. The twelfth death at the border this year. The third minor killed this year. Questo articolo è stato pubblicato in Senza categoria il 18 settembre 2016 da EXODUS - watchtheborders. 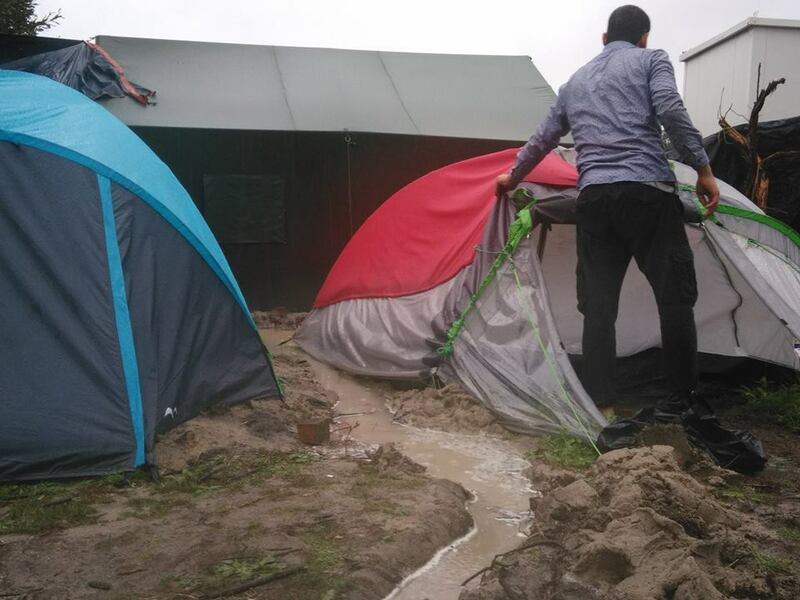 via Refugee Info Bus: Wind and rain in the Calais refugee camp. These small weekend camping tents are not good enough for a human to live in. The “jungle” is half dumping ground and half sand dunes. The natural water level is only one or two feet below ground level. So every time there is a hard down pour, homes, bedding and possessions get flooded. With rain predicted for the next week, there is nowhere to dry off. Overcrowding is so bad that most in the flooded areas have nowhere else to move to. The Refugee Crisis in Europe is a political problem but on a day like today, we only see the humanitarian disaster. Editor’s note: I disagree it can be seen as an humanitarian disaster: the authors of this disaster are the politicians who forced people to live here, instead of providing them with proper accommodation, and now are threatening to destroy the ‘jungle’ – that is not even a jungle, jungles were autonomous self-organized places on ground chosen and squatted by the migrants not by chosen by the government, this is a dumping ground for people. 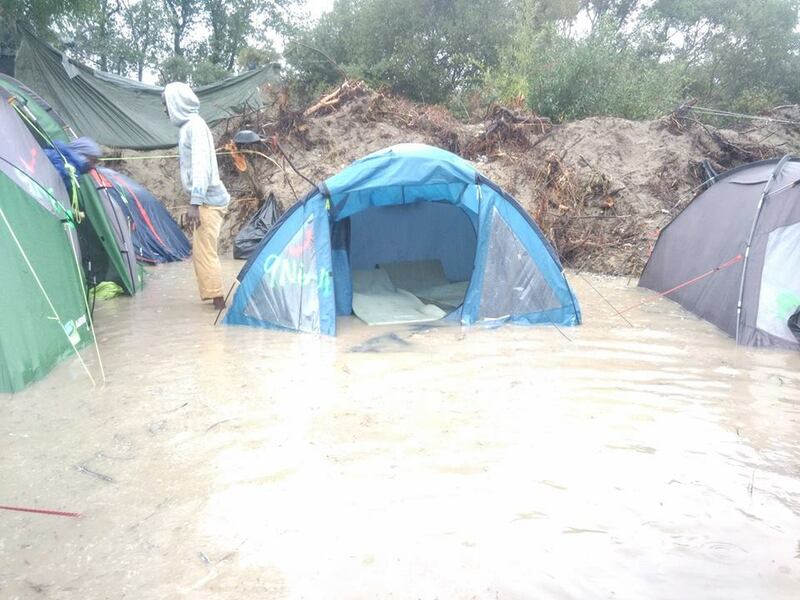 The associations, Medicins Sans Frontieres for the first, said it for the beginning: this place is not suitable to host a camp, because it gets flooded due to layers of clay under the sand. NOW THERE ARE OVER 10.000 INNOCENT MEN WOMEN AND CHILDREN CRAMMED THERE, AMASSED IN THE NORTH SIDE AFTER THE EVICTION OF THE SOUTH SIDE, THAT IS LESS THAN 1/3 OF THE ORIGINAL SIZE OF THE CAMP, AND THE MOST VULNERABLE TO FLOODING; IN TOTALLY OVERCROWDED SITUATIONS, AND NEW PEOPLE KEEP ARRIVING, UP TO 100 PER DAY! 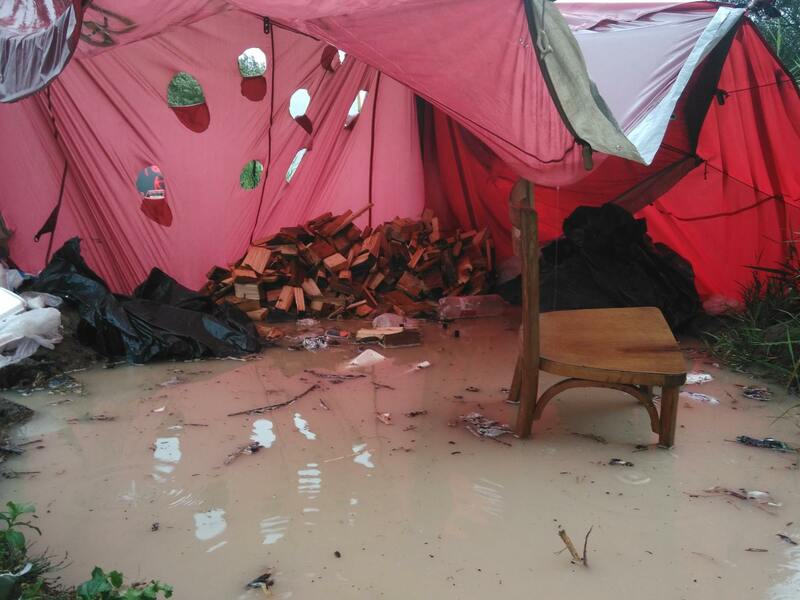 And the authorities are stopping volunteers from bringing materials for building shelters into the camp, thus people are condemned to live in tents. We urgently need humanitarian aid, but most of all we need political solutions, opening the border(s) and decent housing for all!!! Over 20.000 people estimated to attend. Lively demonstration, with Syrian and Afghan refugees at the front. Calais came second row, as volunteers and activists brought banners made by children living in Calais camp. The march went from Marble Arch (Park Lane) to Parlaiment passing Trafalgar Square and Downing Street. There was a rally in Parlarliament Square. The politicians’ speeches were boring, quite frankly, none of them seemed to have much to say – except, of course, Lord Dubbs, and he kept his speech very short and to the point. THIS was another interesting speech (the boy is saying he is very lucky to be here and thank you everybody for welcoming him and his family, but many others are not so lucky and they are still dying or languishing in refugee camps): At the end of the rally there was a skype connection with Calais, direct from the ‘jungle’, and a Calais activist got to announce the 1st October demonstration from the stage – asking people to support and add the name of their organisations. Leaflets of the demo in Calais were distributed during the march and rally. A few problems with security, behaving in quite authoritarian manner – it is rumored they hired private security. It ended with Syrian musicians playing freedom songs and traditional music on stage, and people dancing in the green in front of Parliament. Good day altogether, good to see so many people in UK supporting refugees and other migrants! 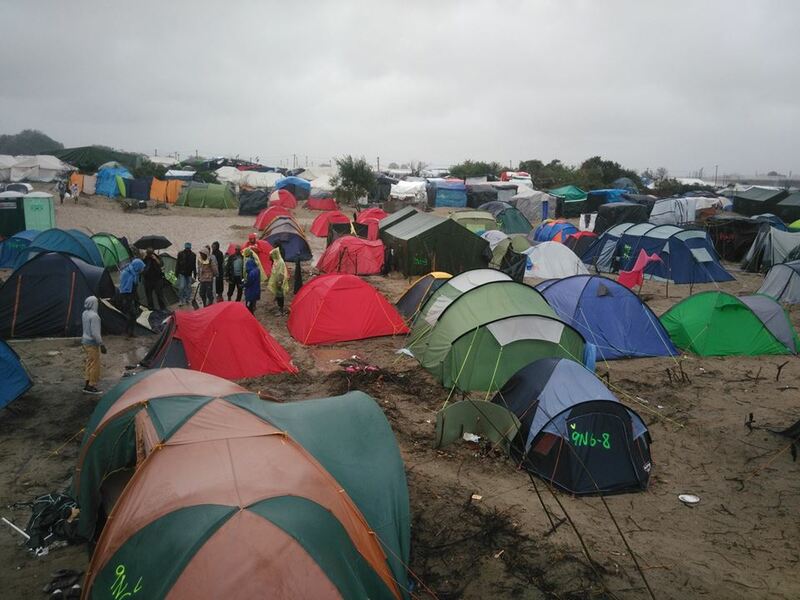 We are happy to announce that many people are going from Calais to the Refugees Welcome demonstration in London: activists, volunteers and peopole from the ‘jungle’ who made it! We will be at the head of the march, carrying the banners children living in the camp made. Questo articolo è stato pubblicato in Senza categoria il 14 settembre 2016 da EXODUS - watchtheborders. Call out to DEMONSTRATION IN CALAIS 1st October 2016 MIGRANTS WELCOME! People are still dying in numbers in the Mediterranean, on the way to Europe and its borders. In Calais the population of the slum is over 10,000 people in more and more appalling living conditions! Here as elsewhere in Europe, the situation gets worse for migrants, showing the ineffectiveness and the murderous character of current policies. 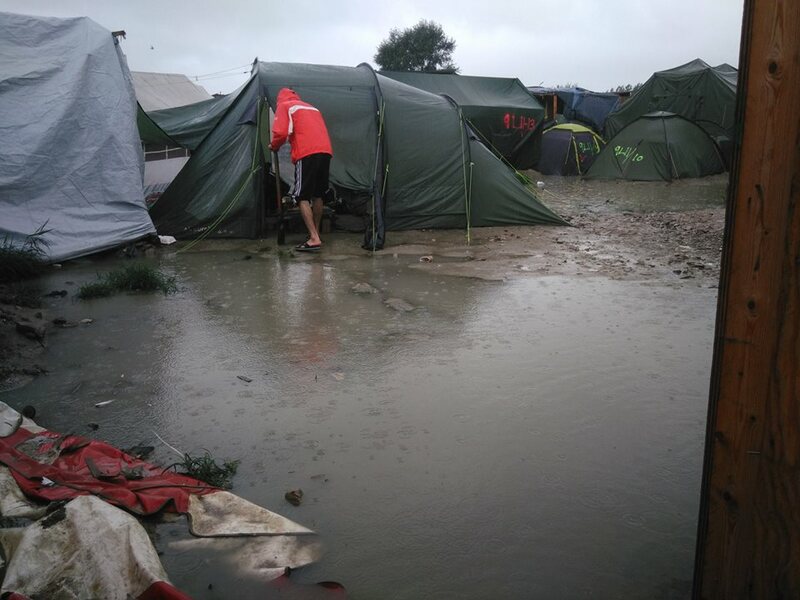 In Calais, the camp‘s destruction can not be a solution! • That Britain assumes its responsibilities in relation to migrants and that France breaks the Touquet agreements, by which UK border controls are in France. • That the national accommodation system finally sees the light in France, as promised. France is the only country in Europe where migrants are left on the streets without protection or support! • The abolition of the Dublin regulations and the dismantling of Frontex, which are the root causes of the tragedies that migrants are now living in Europe and at its gates. • The closure of all detention centers and hotspots in Europe, following the international call for the closure of detention centers and HOTSPOTS in Europe. More than ever, we oppose racist and criminal policies being implemented against foreigners in Europe. We affirm our full right of freedom of movement and freedom to stay for all migrants. All collectives, associations, unions, parties … and particularly those present in Calais and its region are invited to participate in the organization of this event and support this action by sending their signature. These insisted, unanimously, on the importance of joint preparation with associations and groups of Calais and its region. Post and spread the word! There will be a second organizing meeting in Paris the 15th at 18.00 (the first was on the 9th in Paris) and one in Calais afterwards, date and time to be announced. A main issue is whether permissions will be granted. It is the people who live in the jungle who will have the last world re. what they want in the demonstration. Refugees and other migrants should be able to travel freely and resettle in a country of their choice. European countries should take in a number of refugees proportionate to their size/ population/ resources and distribute them equally inside their territory – instead of letting them accummulate in places like Calais, Lampedusa, the Greek Islands. The situation in Calais is tragic and unsustainable, for the refugees in the first place, but it creates huge problems for the local population and for the drivers in transit too. The closure of the border is to blame, not the refugees. The inhumane and demented politics of the UK and French governments are to blame. They have created this situation in the first place. It is unimaginable that 10.000 men women and children can live there. Recent talks between Theresa May and the French Interior minister have re-affirmed ‘co-operation’ between the two countries, border controls in Calais, and the treaty of Toquet, by virtue of which the UK border is in France, stays in place. With all the consequences we can see. The destruction of what remains of the ‘jungle’ will acheive nothing but creating more death and suffering for those who pass through Calais, and more problems for the local population. The destruction of the North side of the ‘jungle’ will not result in people going away, it will result in people spreading all along the coast and inside the Calais region; it will result in new informal camps popping up everywhere, people will be more exposed to violence by police, mafia and fascists, and less easy to reach by humanitarian associations and volunteers. The most vulnerable, such as unaccompanied minors and families with young children, will be the most affected. The destruction of the South side of the ‘jungle’ did not result in a reduction in numbers, as everybody can see. The destruction of the South side was carried out by riot police (CRS and gendarmerie) in the most violent and dangerous manner with great use of CS gas and causing many fires – the entire Afghan section of the camp was burned to ashes. Every day people are hit by police (CRS) on the motorway, sprayed in the face, including women and children, and flashballs are fired directly into the crowd, causing untold numbers of horrendous and oftern life-threatening injuries. We do not support the existence of the ‘jungle’. It is not fit for human habitation and it is not even a jungle but a dumping ground for people choosen by the French government and the Interior minister bernard cazeneuve (not deserving of capital letter) in a Seveso-classed area, where they are surrounded by a couple thousands very violent riot police. Calais jungles were truly autonomous spaces on land choosen and squatted by the people themselves. People leave their countries because they want to live and not to die, and repressive measures are not stopping them from coming. We are in the middle of the biggest refugee crisis since WW2. Taller fences and stricter immigration controls are not stopping people from coming, they are only causing unprecedented numbers of people to die at the borders of Europe. People leave their countries for very pressing reasons because of war, persecution, extreme poverty, climate change. Most would never leave if it was not for saving their lives. Most would like to go back to their countries if they could. Capitalism in its current stage is creating more wars, instability, hunger and envrionmental disaster than ever before. It would be naive to expect that the same economic and political agents who are creating such disasters could also provide a solution. The only solution would require the overthoring of the ruling classes and to establish different societies based on equality, cooperation, sharing of resources, human rights and respect for life. The situation in Calais has been left to degenerate. To resolve the problem it would be necessary to offer people decent accommodation elsewhere, and the possibility to be accepted and resettle either in France, in the UK or in another country. Strong repessive measure not only are inhumane but they do not work, as Calais’s migration history since the closure of the camp at Sangatte (2002) clearly demonstrates. What is wrong with the ‘solutions’ proposed by the French government? -The number of places offered in CAOs (Centres Accueil et Orientation) is insufficient. – CAOs are only temporary. – The only solution on offer is to ask for asylum in France. How many people do you want to ask for asylum in France? Why cannot they make different choices? Why should them all be co-opted to apply for asylum in France? The Legal Centre in the jungle and the Info Point aim at giving people information / help with the process of applying for asylum either in France, in the UK, or in other European countries, people can make choices. – Those who have finger prints in European countries other than France are deported there directly from CAOs, usually. – The ‘orientation’ is absent, except where there are associations and volunteers providing it. – The quality of accommodation variates very much, some CAOs are very nice, others are dreadful. Moreover, some CAOs are in small villages or in the middle of nowhere, leaving people totally isolated. – Adults, kids, men, women are mixed together with no consideration for privacy and safety. – Drop our rate from the CAOs is very high, average 45%. Those who drop out are punished by being left without any State support for 18 months, therefore falling into destitution. – France in general, and Calais in particular, have high unemployement rates, leaving people little chance to work and integrate. – Refusal rates of asylum applications are very high, and on the rise. Of course for some individuals, nationalities and groups is worth considering applying for asylum in France, but others have much better chances to be accepted elsewhere. Housing is an unconditional right, people are entitled to housing because they are people. A house is a house, not a camp, not an hotel or holiday place, not a cabin in the ‘jungle’, not a tent in an informal camp in the woods and not a sleeping bag by the side of the road. To ‘house’ people in a place like the ‘jungle’ is a clear violation of their human rights. However a violent eviction will only lead to more injuries, and possibility deaths. It will not solve any problems for the local population, it will only create new ones. Calais problems, such as the highest rate of unemployement in the whole of France, are real and do exist independetly, have other origins than the migrants in Calais. It is not the migrants’ fault if around 90% of the merchanidse directed to the UK pass through Calais and the residents do not even get the breadcrumbs – though they suffer the consequences, such as very high air pollution. The fact that lorry drivers often get in trouble with migrants trying to board the lorries has no effect on the Calais economy. It is scary for the drivers, but no driver has died so far; instead lots of migrants have died, or have been seriously injured on the motorway and near the Eurostar. The little toursim from the UK from which Calais was benefitting many years ago ceased long before the refugee crisis, mainly due to increased taxes on alcohol and tobacco. The so called ‘jungle’, the shanty town by the centre Jules-Ferry is not a nice place. Nobody but absolutely nobody wants to be there. Segregation has only exacerbated racist feelings. When migrants could be seen in or near the city there was a relationship with the locals, sometimes tense, sometimes of solidarity, however a relationship. Maybe, when cazeneuve forced people out of town and out of sight, he did not notice there is a motorway next to the Lande, or he did not care. The motorway with annexed ‘jungle’ is the media circus from where racist and xenophobic feelings are spinned. Damn right that ‘jungle’ shoud disappear. But not by means of a violent eviction. The ‘jungle’ refugee camp faces destruction by the French government following the visit of Minister of Interior Bernard Cazeneuve and now a blockade starting on Monday by local businesses, truckers and dockers. The refugees have been attacked by the French and British governments and a hostile press. Rather than taking on their responsibilities to those escaping war and poverty both governments are scapegoating them. We want to show our solidarity with the refugees, oppose the destruction of the camp and demand that the UK government acts on the Dubs amendment to the Immigration Bill (allowing unaccompanied child refugees into Britain) now as a first step to offering the support and solidarity that is needed. Questo articolo è stato pubblicato in Senza categoria il 3 settembre 2016 da EXODUS - watchtheborders.